Help Generator for Excel allows to document simple to complex Excel systems with minimal effort. The Help Generator interrogates structure and content of Excel documents to generate logical help content automatically. The Help Generator for Microsoft Excel can reduce the time required for documenting by 80%. No special documentation skills are needed as the program makes hep content for both online publishing and Microsoft Word. The Help Generator scans the Excel sheets, charts and VBA project components and creates all needed files with content. Screen shots are made automatically and text is picked up formulas are parsed. A Help Editor is included to complete the help content by making adjustments and modifying the automatic sections created. 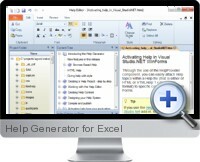 The Help Generator supports Excel 2007 and 2010.